The Quest Soccer Camp has announced that due to overwhelming demand the proven successful Quest Soccer method will be expanding within South Florida as well as outside the region. The Quest Soccer Camp held in Southern Dade County for the past 5 years is now sponsoring support soccer camps in other areas. The Quest Soccer Camp has created a cafeteria-style soccer program to assist recreation programs with their soccer needs. Equipment, programs, coaches, advertising, processing, and administrative services are being offered to recreation directors and soccer coaches who are seeking the benefits and experience of the Quest Soccer Camp but are unable to be in South Florida. The innovative idea of taking the popular Quest Soccer Camp methods to smaller programs and recreating the South Dade experience has already taken hold in the Village of Virginia Gardens, Florida. 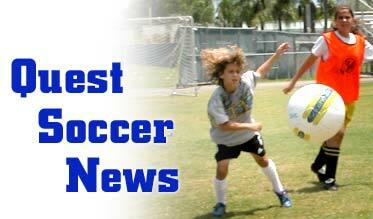 A Quest Soccer Sponsored Camp will be held from July 24-28, 2006 and July 31- August 4, 2006. Interest in Quest Soccer Sponsored Camps is also in Jackson, Mississippi, Lawrenceville, Georgia, and the Mad River Valley, Vermont.